Tomorrow is American Thanksgiving, and the snowstorms in the northeast pose a serious threat to holiday travellers this year. 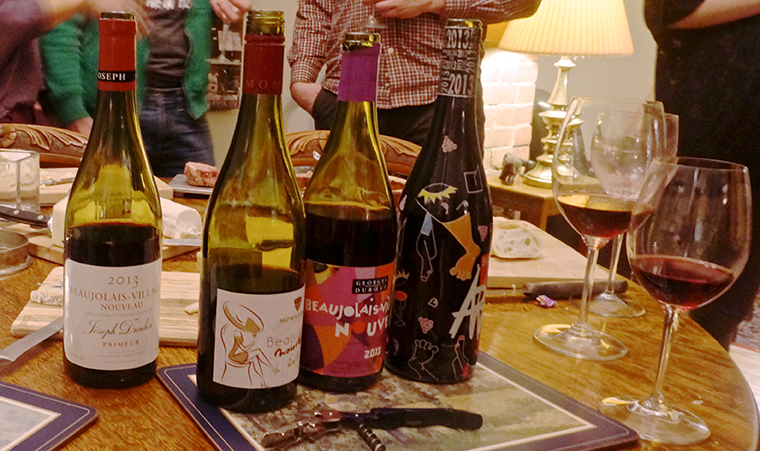 If you are one of the thousands who will not make it out of the garage this holiday, may I propose a small gathering of neighbours (or neighbors, for the American readers) to resurrect that 1980s tradition: Beaujolais Nouveau? No-one is more rigid about the rules, when it comes to vintages, than the French. But even they could not miss the marketing opportunity presented by the release of the new Beaujolais on the third Thursday of November, exactly one week before American Thanksgiving. So this week, if a turkey is not in your horoscope, why not raise a glass of Nouveau to absent relatives. My personal favourite was the Mommesin, but most seemed to prefer the last one they sampled, which says something – not sure what, exactly. And can I confess that it really doesn’t matter to anyone if Beaujolais Nouveau is not really as good as regular Beaujolais? The point is that it’s a great opportunity to get together with friends, over delicious food and (let’s call it) novel wine. I am thankful for friends like Paul and Mel, who opened their home to us for the 2013 taste-testing. I regret not taking a picture of their beautiful leek and potato soup and boeuf bourgignon, but hope that my panorama of the spread below will inspire you to think beyond the turkey this holiday. What are you thankful for?